Do you remember the flash cards you used at school to learn how to read and spell words? Guitar flash cards are based on a similar idea but instead of spelling they help you to learn the notes on your guitar fretboard. 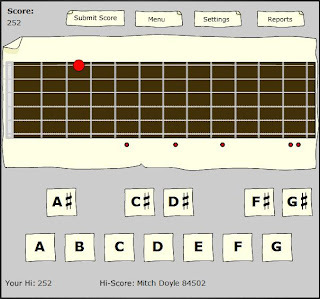 It uses the idea of a simple flash card game to show you notes on a guitar fretboard one at a time. The more notes you guess right the more points you score. The best feature of guitar flash cards is that it learns the weaknesses and strengths in your fretboard knowledge as you play. It then adjusts games to give you most practice on those parts you're weakest at. Who is guitar flash cards for? Guitar flash cards can be used by guitarists of any level who wish to improve their fretboard knowledge. You'll find them especially useful if you have some spare time around a computer that you could use to work on your guitar skills, for example, during your lunch break at work or while you travel. To play guitar flash cards all you need is a PC or Mac with a web browser and Internet connection, then visit the guitar games web site to play. Playing guitar flash cards to learn fretboard notes is easy. First you visit the settings page to choose which strings or range of frets you want to work on. You can also choose other options like whether you'll be quizzed about sharps and flats or not. Start a game and you'll be shown a fretboard image with a fret position highlighted by a red dot. Press the button matching the note you think is shown by the red dot and the computer tells you if you're right or wrong. If you're wrong a Show Answer button appears to let you discover the right answer, but you can keep on guessing if you want to. The computer keeps track of your score as you play awarding you points when you get the note right and removing points when you guess wrongly or click Show Answer. At any time Guitar flash cards can show you a report of your progress. You'll see a coloured chart showing you clearly how you're doing on all areas of the fretboard. Red means you're getting the notes right and blue indicates frets where you need to work more. The Guitar flash cards game is an excellent aid to learn the notes on your guitar fretboard. If you want to improve your fretboard knowledge with a fun and easy approach from any place with an Internet connection then Guitar flash cards is for you.